At the start of March, I gave myself a stern talking to and decided to enter a sew-along. My first ever. The Winifred Dress by Bluegingerdoll, to be precise. I had been admiring her from afar and it seemed the perfect style for this panda. Winifred with a longer hem. Because I’m worth it. However, all did not go according to plan and to regurgitate the rather hackneyed expression, it was a bit of a journey. That journey began with the much delayed arrival of the pattern itself, ordered 5 March, arrived 29 March. Abby of Bluegingerdoll shared her frustrations at the shortcomings of the Australian post office and emailed me the pdf so I could start long with everyone else, bless her. 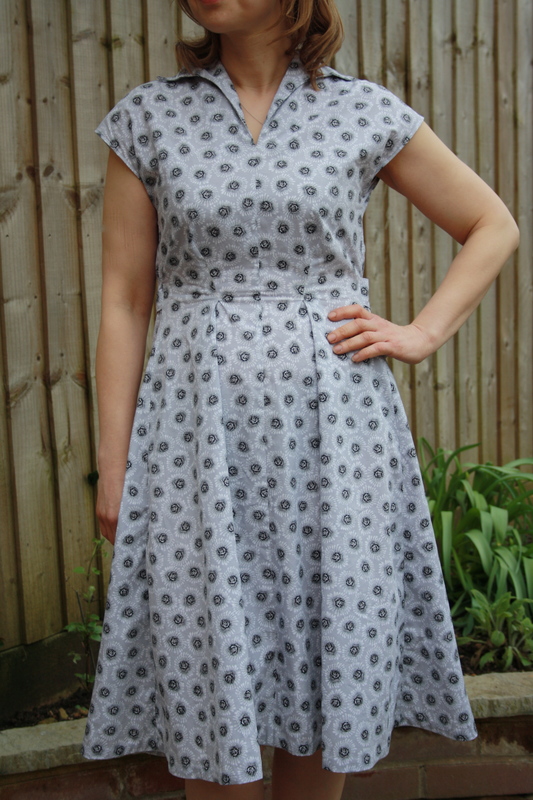 It wasn’t the most auspicious of starts but I was armed with some beautiful cotton bought from Ditto Fabrics (grey Retro Rose by Makower) and I could see the dress in my head – question was, could I sew it? I love love love the expression [sewed] “like a boss” which I believe – and of course I may be wrong – originated with Lauren Lladybird. I have my own sewing simile now, post Winifred: sewing like an arse. Arse, arse, arse. Saying it repeatedly brought some relief. Good job I can laugh about it now. Much. Anyway, back to Winnie. Being a good panda and reading and following Abby’s instructions, I constructed a muslin. Despite my measurements being well within the size 8 spec, my muslin became wedged around my bazookas and I feared that I would have to cut myself out before losing consciousness as my chest was so constricted. Small matter, muslin numero dos fitted just dandy although I did add 1/2 inch to the armholes front and back. I blame my obsession with kettlebells, but I’m shoe-in for arm wrestling competitions these days. Anyway, fair dibs Abby, as there was enough fabric to cut out the dress but not an annoying amount spare, if you know what I mean. Step by step I followed the sew-along until I got to the collar, whereupon I behaved like a cat repeatedy running at a closed cat flap. I swear you could see the smoke rising from the old grey matter as I tried to understand and make sense of what I was doing. Eventually I emailed Abby, as it appeared from the Winifred Facebook page that no-one else was having a collar issue, and she duly replied. But the time difference between West Oxfordshire and Melbourne meant that I had my eureka moment …at 12.45am… before I got her reply. I couldn’t go to bed until I’d figured it out. Nevermind the pressing work deadline facing me the very next day, at least the collar was on! It may not sound a big deal when written with due brevity here, but collar-gate lasted several days – my children went hungry, the dog was unwalked, I barely spoke. I am pernickety about my sewing. I want it to be good and I want to get better at it. The finishing matters. I want collars with points. Hems that are even. A dress that looks good inside as well as out. La la la. 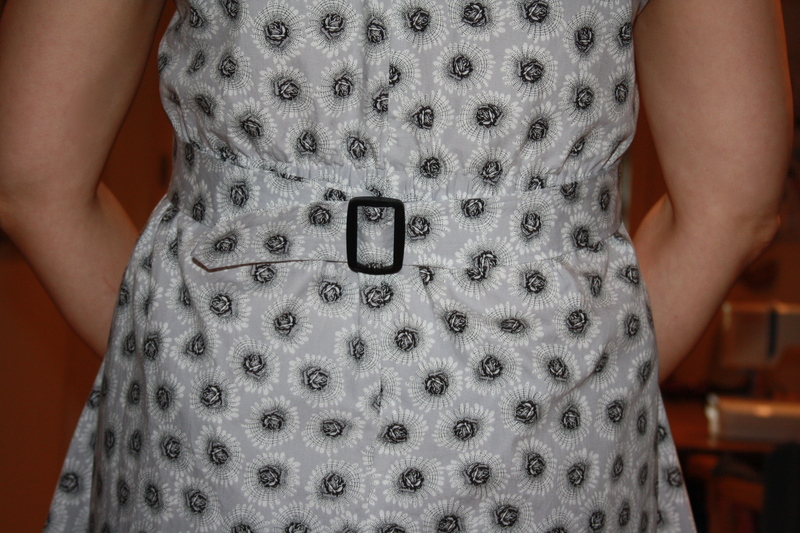 I’m keen to improve and that’s part of the joy of sewing again. I’d found a lovely slide buckle for the back of the dress from Minerva Crafts, as well as some gorgeous lilac bias binding. But godammit the buckle was too BIG. Growl. Gnash. Fury. I bought another. Wrong colour. More gnashing. I ordered another from Ebay and at last a fit worthy of Cinders. Buckle on I was ready to hem. I left the hem a bit longer because, well, I wanted to. Maybe next time I’ll be daring. Because I loved the bias binding so much, and I’d bought extra, I decided to cover the raw edge of the skirt in bias binding (or whatever the proper technical term is) and then hand sew the hem using slip stitch. Other sewers regularly wax lyrical about the joys of hand-sewing, and I never thought I’d join them, but this is the second time I’ve done a fair bit of hand-sewing as part of my garment finishing, and I really enjoyed it. 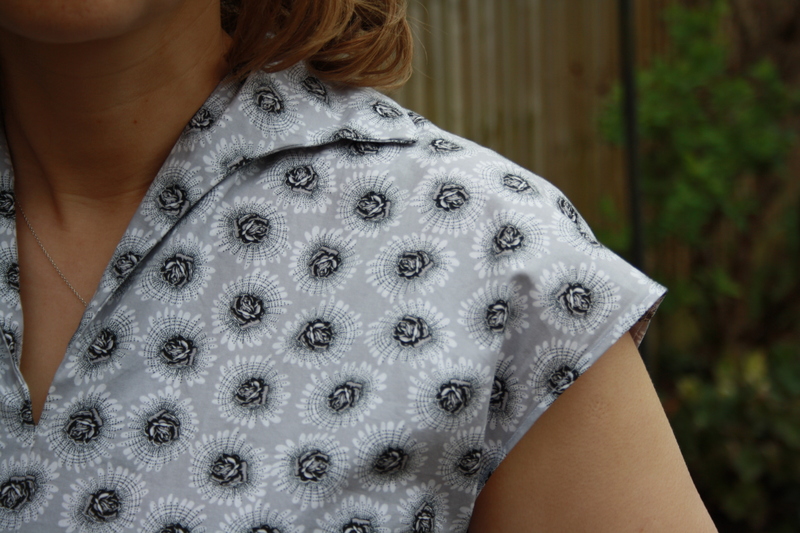 I used some bias binding for the inside collar too and used my overlocker, which I’m driving as an automatic (if you get my gist), to finish the rest of the edges, apart from the centre front and centre back which are French-seamed. Anyway, she’s done, finished, Miss Winifred. I’d say take a bow, but that’s Sheila, and I think Winnie should be more of a curtsy. Ta dah!